There’s nothing wrong with being rich, but some companies make some really stupid products that surprisingly really do get bought. Would you buy a gold flyswatter? How about diamond studded chopsticks? I don’t know if those two items exist since I just made them up just now, but check out the top ten list below to find out some actual products that are really ridiculously priced which only rich people could buy. You would have to have way too much money to buy any of these. Filthy Rich Stuff Hungry for a donut? 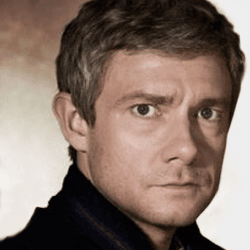 Got too many hundreds in your wallet? 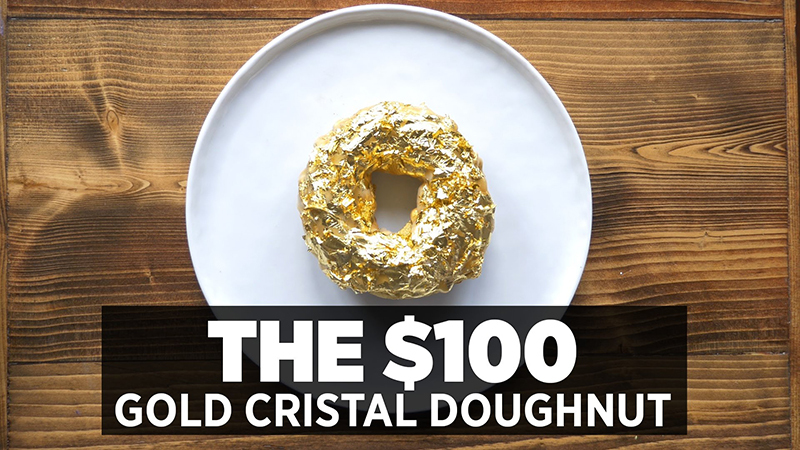 No worries, now you can kill two birds with one stone by getting this donut gilded in 24-karat gold for $100 each. Why not get a box for the office? Named the "Golden Cristal", this luxurious donut is gilded by hand in 24-karat gold dust and 24-karat gold leaf. It has Cristal champagne icing on top, and inside it contains ube mousse and Cristal jelly. Filthy Rich Stuff When you want to show how filthy rich and successful you are, details matter. Make sure that your receptionist is aware that their instructions on how to shred this instruction pamphlet have been stapled together with a staple worth more than their daily net income. Check out this funny gold staples video. "I only buy solid gold staples!" Filthy Rich Stuff What better way to pretend to be frugal when you know you're filthy rich and want to continue to feel filthy rich while giving the appearance you're frugal than to spend $180 on a bowl of ramen noodles. A Japanese restaurant in Manhattan called "Koa" calls it the "world's most expensive ramen." For the $180 you get a rich assortment of toppings, including shaved truffels and Wagyu beef. Filthy Rich Stuff You really don't care about tennis, you're only at the tennis club which you spend $100,000 per year to have the privilege of attending so you can network with other wealthy people. So why not show how filthy rich you are by encasing your tennis balls in a $1,500 tennis ball container? Who needs the free bottle that they come in anyway? Filthy Rich Stuff So you just turned 15 years old and you want the other rich kids to see how filthy rich your parents are. 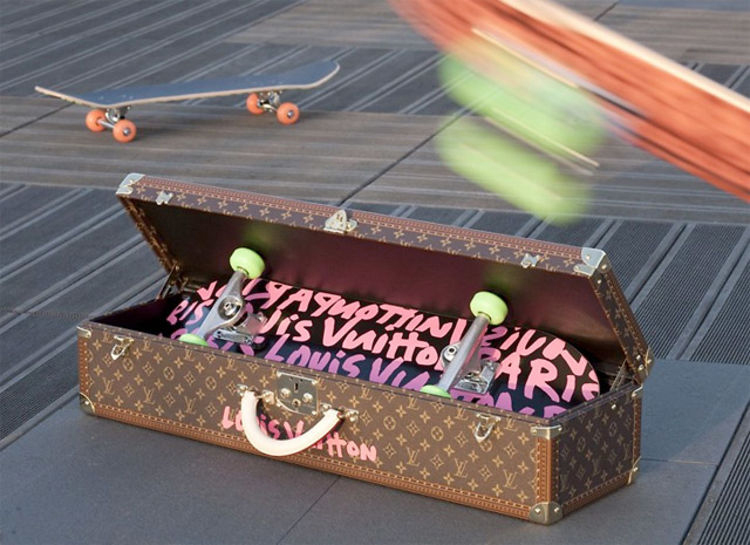 Convince them to drop around ten thousand dollars after tax for this skateboard that is no better than a nice high-end $300 skateboard except that yours says Louis Vuitton on it and comes in a lavish suitcase. Now your other filthy rich friends will be jealous! Filthy Rich Stuff It's hot outside and your private island isn't ready yet. You're thirsty and have this bag of cash. What do you spend it on? A bottle of water containing gold dust, of course! For only $60,000 per bottle you can get water from the glaciers of Iceland in a golden bottle. Acqua di Cristallo “Tributo a Modigliani” bottle of water really contains actual glacier water from Iceland, with a mix of France and Fiji spring waters. Because any of this really matters. 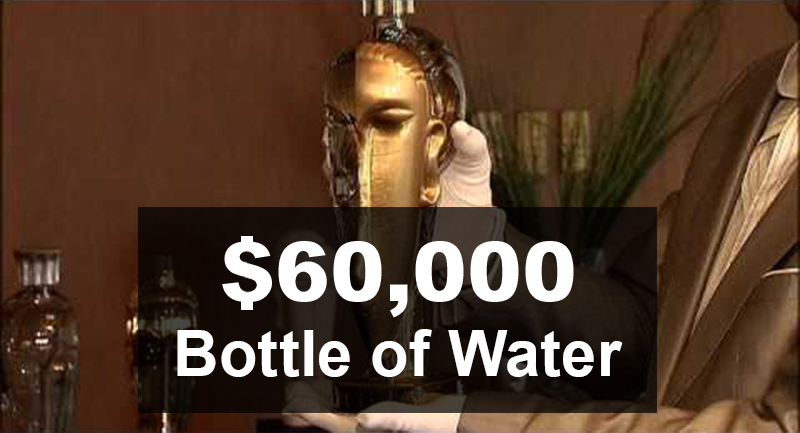 5mg of 23-karat gold dust is also added into the mix, and the bottle is not even made of gold - $60,000 is just the cost of the water. Filthy Rich Stuff You are a hamburger connoisseur with way too much money, you have to spend it somewhere! 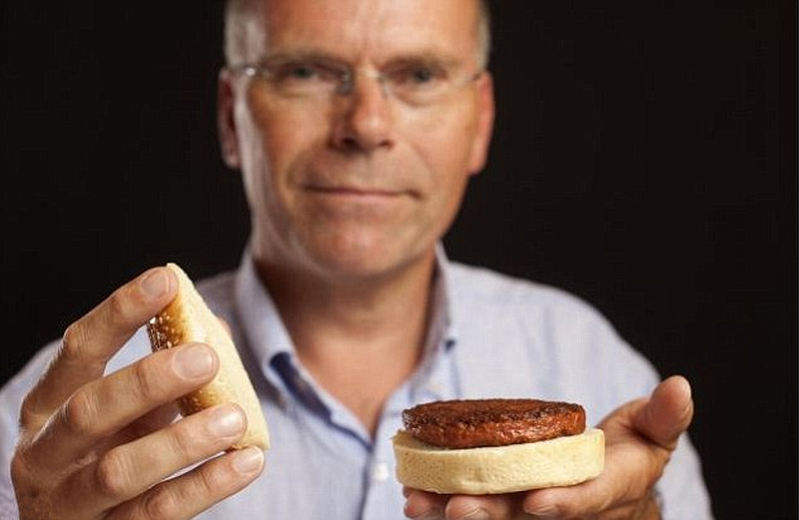 Pick up this perfect hamburger grown in a laboratory from bovine stem cells for less than half a million dollars! Pocket change. Developed at Maastricht University, the 142g (1/3 lb) patty took three months to grow in a laboratory using stem cells from a living cow. Filthy Rich Stuff What better way to throw away $1 million dollars than to use a fishing lure that cost $1 million? Covered in diamonds and rubies, imagine how you will feel when you snag the line on a tree root or tree branch and it snaps. Better pay a team of slaves *ahem* servants like $10 per hour to trawl the bottom of the lake until they find it! Filthy Rich Stuff So you're so filthy rich and you don't have anything else to buy. You've already bought your mansion and an airplane hanger full of exotic cars. Your whole house is coated in gold, including your bathroom. Wait - there's something missing! That toilet paper made of real $100 dollar bills just doesn't match the gold bathroom theme. Better get some gold plated toilet paper! After all, it's only $2 million each. Filthy Rich Stuff Why pay $379,000 for a full-size Lamborghini Aventador when you can buy a 1:8 miniature model Aventador for $7.5 million? After all, you could get more than 20 full-sized Lamborghini Aventadors for that price. Why get 20 more real ones when you can have one mini one that can sit on your shelf? You have an airplane hanger full of Lamborghinis and other exotic cars already. Now you can look at a mini one while you work and feel good about a well-spent $8 million dollars! 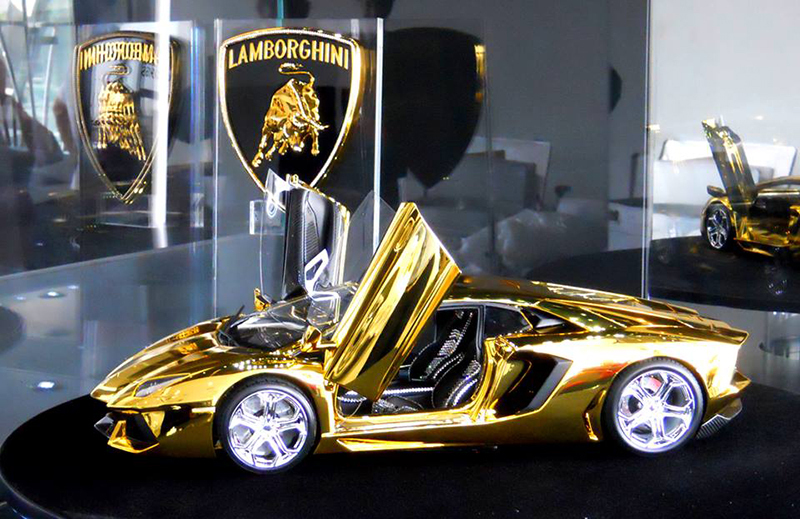 This model Lamborghini is 1/8th the size of a real Lamborghini, which contains 55 pounds of gold ($1,170,752 in gold @ $1,330.68/oz). 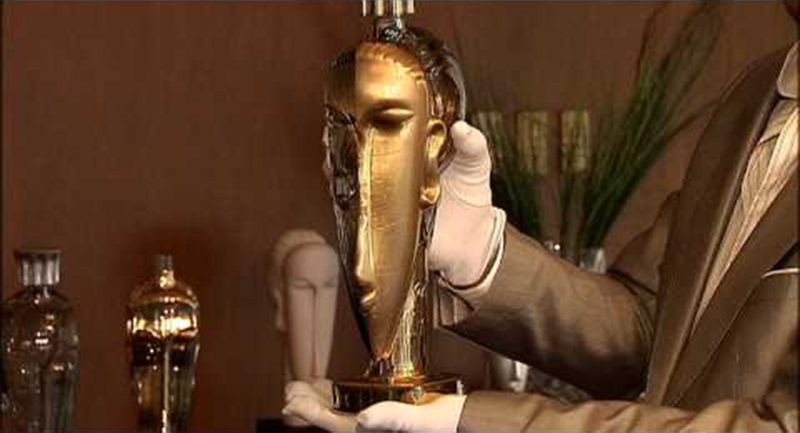 It was literally carved out of a piece of solid gold. There are also $1.47 million dollars worth of other gemstones on the car. $650,000 will go to charity. This leaves a profit of $4,210,000 - for a model car. The model was built by RGE Robert Gulpen Engineering and is modeled after the Lamborghini Aventador LP-700-4. It does not drive, it is only for decoration.